While international news outlets are tying themselves up in knots after a weekend spent dissecting the Trump administration's temporary immigration restrictions, official Washington is posed to welcome a foreign dignitary and guest. Although there is no official meeting scheduled between the White House and Jordan's King Abdullah II when he visits Washington this week, lawmakers and government officials would be wise to use the opportunity to strengthen the bilateral relationship and layout the broad strokes of the Trump administration's vision for region. To that end, the King will be meeting with senior administration officials and lawmakers from both sides of the political aisle. On Thursday, he will be delivering remarks at the National Prayer Breakfast, which President Trump is also scheduled to attend. It isn't hard to imagine a scenario where the two may briefly meet, and if so, he will be the first Arab leader to meet with Mr. Trump as president. While in Washington, the King will want to gauge how involved the U.S. intends to be in Middle East affairs and understand the nature of that involvement. He will also be interested in securing an American commitment for further economic assistance in the face of the regional storm that's buffeted his kingdom in recent years. Jordan has also served as a critical base for U.S. air operations against ISIS (or the Islamic State) in Syria. The U.S. will likely want to see that role continue as they discuss a number of issues upon which the interests of the two are aligned. Two related questions will be important regarding the new Trump administration's approach: The first is will U.S. policy continue to promote an ascendant Russian-Iranian, Shi'a and not Sunni, regional architecture that the Obama administration sought to cement? The second is will America work with, against, or autonomously from Russia in the quest to defeat ISIS in Syria and Iraq? King Abdullah II arrives in Washington for what the Jordanian embassy has called "a working visit", on the heels of last week's meetings with British Foreign Secretary Boris Johnson and Russian President Vladimir Putin. What he heard from them will be synthesized with what he hears on Capitol Hill and elsewhere in Washington. How the U.S. proceeds with its relationship with Russia has many implications. The recent absence of American leadership in Middle East provided an enticing arena for Putin to flex his military and diplomatic muscles. After a 40-year hiatus as powerbroker, Russia is now punching far above its weight in the heart of the Middle East. Putin wants the world to know that he is hosting the only game in town where a solution to the Syrian crisis can be found. One byproduct of America's absence and subsequent replacement by Russian military assertiveness is the refugee crisis that has not only overwhelmed Syria's neighbors, but Europe as well. It has also provided an added impetus for President Trump's recent executive order on temporarily curbing immigration to the U.S. from seven Muslim majority countries, including certain Middle Eastern states—in which Jordan is not included. If the Trump administration seeks to undermine Russia's interests in Syria, which many would argue is in America and the Syrian people's best interest, Jordan will need to know. That presidential level decision would affect the degree of foreign policy freelancing America's traditional allies engage in during their absence. 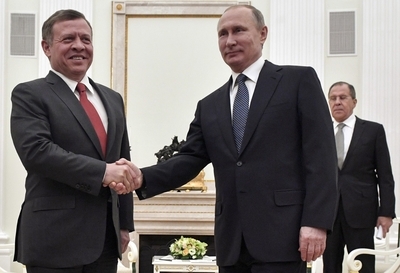 That answer could also serve to dispel the idea among some Jordanians who believe Russia is "the linchpin to any regional settlement" and who call for a further recalibration of Jordan's Syria policy towards the Russian position—away from what the Trump administration may have in mind. 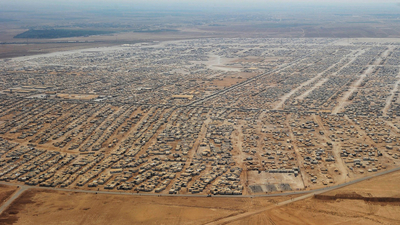 The Hashemite Kingdom has been chaffing under the weight of Syrian refugees for years. While the United Nations says that Jordan hosts some 650,000 registered refugees, the real number is much closer to 1.4 million, representing close to 15 percent of Jordan's total population or 46 percent of non-Jordanians living in the Kingdom. As Jordan specialist, David Schenker explains, given the effects of regional tumult on the Jordanian economy, the unemployment rate reached 15 percent with youth unemployment hitting 40 percent in 2016. The vast majority of Syrian refugees have settled in Jordan's cities and towns, renting homes and participating in the local economy. Skilled Syrian tradesmen have tended to fetch a better price than local craftsmen, further contributing to an anemic Jordanian workforce participation rate that stands at a paltry 36 percent, according to the World Bank. That means nearly 60 percent of the working age population is inactive. While the refugee issue is only one aspect of the many problems facing the Jordanian economy, the regional unrest has certainly exacerbated it. Given Jordan's small size and weak economy, it has long been reliant on international assistance. Recognizing the rarity of pro-Western Middle East allies, Washington provided $1.6 billion in economic assistance in 2016, including nearly $800 million in military aid. The increase came from the U.S. State Department in 2015, which provided for an additional $1 billion annually for each fiscal year in 2015, 2016, and 2017. According to the State Department, the increase was to meet their immediate needs stemming from the regional unrest and the efforts Jordan is undertaking "at the forefront of the fight against [ISIS] and other extremist ideology and terrorism, the influx of refugees from Syria and Iraq, the disruption of foreign energy supplies, and other unprecedented strains." The State Department's statement added that the additional funding was "designed to address Jordan's short-term, extraordinary needs, including those related to regional instability and rising energy costs." The increase is set to end on September 30, but the return on investment has helped ensure the survival of the Kingdom that is precariously sandwiched between Syria, Iraq, Saudi Arabia, and Israel. The Trump administration should actively encourage further Jordanian-Israeli cooperation on a host of projects that also benefit the United States. The two Middle East neighbors have quietly maintained intimate security and economic relations since signing their 1994 peace treaty, weathering many political and diplomatic storms along the way. In a sign of growing military cooperation, in 2015 there were multiple reports suggesting an unnamed Arab country (other than Egypt) participated in "Red Flag" training exercises with U.S. and Israeli pilots. U.S. officials suggested that Jordanian warplanes not only participated in these drills but that their jets even refueled from an Israeli tanker over the Atlantic Ocean. The U.S. should also promote further cooperation on the water issue such as the 2013 and 2015 multi-billion dollar regional water agreement between Jordan, Israel, and the Palestinian Authority that could pave the path for the Red-Dead Canal. The 2016 Omnibus Appropriations Act specifies that $100 million in Economic Support Funds (ESF) be set aside for water sector support for Jordan, intended to support the Red Sea Dead Sea water project. Another byproduct of the regional chaos has been Jordan's need to purchase natural gas on the open market since 2011 because of repeated terrorist attacks against Egyptian gas pipelines in the Sinai Peninsula. In 2016, Jordan's state-run power company made a $10 billion natural gas import deal with a consortium of U.S. Noble Energy and Israeli Delek Drilling and other companies. The deal will supply Jordan with 1.6 trillion cubic feet of natural gas, meeting an estimated 40 percent of the Kingdom's electricity needs. Israel's offshore Leviathan field is set to provide shipments to Jordan starting in 2019 through a pipeline currently under construction, saving the Jordanian government $600 million annually and avoiding sharp hikes in energy prices to an already cash-strapped population. The U.S. would do well to discuss a new economic package for Jordan in the context of some other issues of interest to the Trump administration, such as moving the U.S. embassy from Tel Aviv to West Jerusalem, and its overall plan to either restart Palestinian-Israeli permanent status negotiations or effectively manage the conflict. Both topics will be of special interest to the King. Jordan has long maintained special ties to the Muslim holy sites in the Old City of Jerusalem. Since Israel came into control of East Jerusalem in 1967 and the one square kilometer of what is known as the Old City or Holy City, a Jordanian Waqf or Islamic custodial trust has administered the Temple Mount and its holy sites by agreement with Israel. Claiming their lineage from the Prophet Muhammad provides the basis for the Hashemite's legitimacy as Jordan's royal family and rulers. Issues that involve a change in the Old City's status create domestic problems for King Abdullah II. As such, relocating the U.S. embassy is not an issue to spring upon Jordan at the last minute, without setting the proverbial table up in advance. 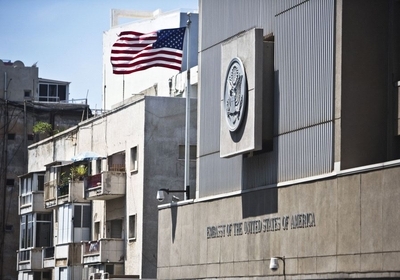 Indeed, a Jordanian government spokesperson, Mohammad Momani, recently warned of "catastrophic" repercussions if the Trump administration follows through on its pledge to move the embassy. He said such a move would be a "red line" for Jordan and "inflame the Islamic and Arab streets" in a manner that would "definitely affect the bilateral relationship" between Jordan and the United States and would further constitute a "gift to extremists" across the region. Such is the intensity of feeling surrounding Jerusalem that his comments came before the Trump administration unveiled any operable plan to relocate the embassy, or explain where and why they would choose to do so. President Trump will need King Abdullah's support, if not acquiescence, for the move to peacefully take place. As the Trump administration contemplates such a move, it should stress to the King that any site for a new embassy building would be in West Jerusalem on land Israel has held since its 1948 independence and before the June 1967 war. That is to make very clear that it would be on land not claimed by either Jordan or the Palestinians and that such a move would not prejudge or change America's view that the ultimate status of East Jerusalem is to be defined through direct Palestinian-Israeli negotiations that will take into account certain Jordanian equities on the matter. Such a deliberate and carefully planned exercise in American statecraft would go a long way toward mitigating a rise from the Arab street in opposition to such a move. There are a number of opportunities the Jordanian King's visit to Washington represents for the Trump administration. While the U.S. and Jordan are not linked through any formal treaty, they have cooperated on a host of regional and international issues throughout the decades. That cooperation intensified since Jordan and Israel signed a peace treaty in 1994 and the relationship has only grown more important since the Middle East erupted in chaos following the dramatic downturn of the so-called "Arab Spring" in 2011. Today, Jordan represents an island of relative stability, an important beacon of religious moderation in a region consumed by Islamist militancy. Furthermore, it is a natural ally in the struggle against ISIS. 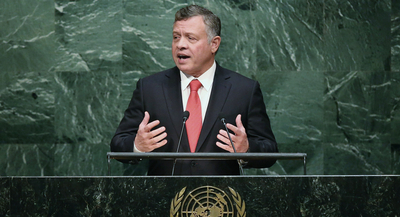 It is in America's interest to ensure the stability of the Hashemite Kingdom and the rule of King Abdullah II. The United States should seek to maintain and enhance the bilateral relationship as part of President Trump's restructuring of U.S. posture and policy toward the Middle East.